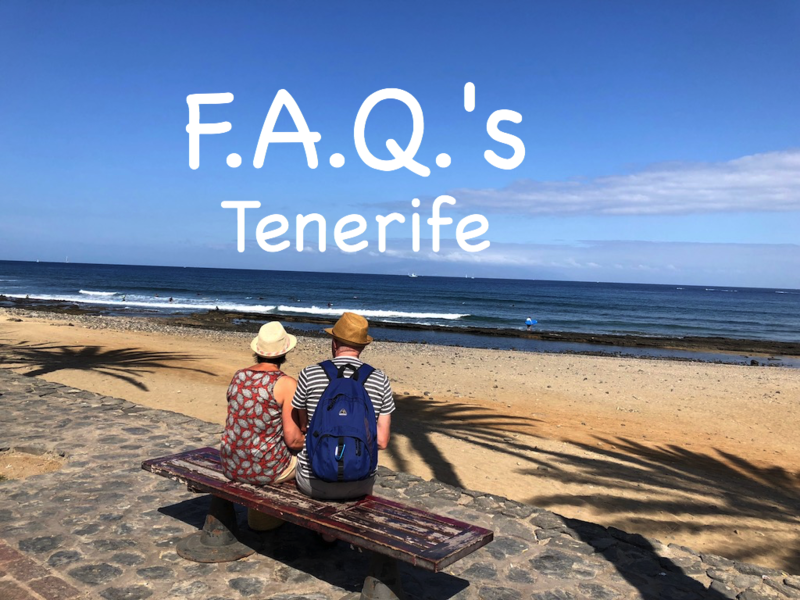 Frequently asked questions (FAQ’s) are really handy for any traveller so here are our FAQ’s about Tenerife. Tenerife is a Spanish island in the Atlantic ocean, 300KM off of the west coast of Africa and it is the largest of the Canary Islands. What is the capital of Tenerife? The capital of Tenerife is Santa Cruz de Tenerife which is located on the eastern tip of the island. Is Tenerife in the EU? Tenerife is part of the European Union. Yes, Tenerife is duty free so you can enjoy cheaper products but do check your duty free allowance limits. It is common for the Canary Islands to be described as having “the worlds best climate”! Tenerife has year round sunshine with the summers being hot and dry. The warmest months of the year are generally July and August with temperatures averaging 24 degree to 28 degrees. January is the coolest month of the year with an average temperate of 17 degrees. The best month to have fun in the sea is September, with an average sea temperature of 24 degrees. What are the resorts called in Tenerife? Costa Adeje is considered to be the luxury resort and it is located on the southern coast of the island. It boasts beautiful beaches, 5* hotels, luxury villas and lots of great excursions for all holiday makers. The course at Golf Costa Adeje will make any golf fan happy, with it’s championship course and stunning views. The resort is also home to Siam Park which is one the best water parks in Europe. El Medano on the south east coast of Tenerife is a small resort with a short transfer time from the Tenerife South airport (TFS). It is known for being a laid back resort and it is popular with windsurfers. The entertainment is low key and casual, so you won’t find discos and karaoke bars but you will find some fabulous restaurants, a well kept town and some great bars. Los Cristianos is located to the west of TFS and it is a busy and popular resort. The resort has a long promenade with plenty of restaurants and bars to chose from and the beach is large with golden sand. The resort offers a variety of excursions that are mostly centered around the harbour, including fishing trips, diving and ferries to the neighbouring island of La Gomera. Los Gigantes is on the south west coast of Tenerife and it is situated at the foot of 300 meter high cliffs. With the exception of 1 multi story hotel, all of the buildings are low rise and the resort is known for being small and tranquil. The marina is the hub of the town and the restaurants and bars offer great service and a chilled out vibe. You can hire sun loungers and umbrellas on the black sand beach called Los Guios, as well having the opportunity to take part in the water sports that are on offer. Playas de las Americas is a lively resort on the south coast of Tenerife. The 1KM stretch known as Veronicas, packs a real punch when it comes to nightlife, bars, live music and neon lights! In the centre of the resort is the well known golf course called Golf las Americas, which is a great 18 hole course. The beaches are golden and sandy and the waters are warm and calm, making it a great day time choice for families during the day. Puerto de la Cruz was the original holiday resort in the north of the island and features the impressive Lago Martiánez on the waterfront. The Old Town has a traditional Canarian character and the harbour is a great place to visit. The resort is considered to be up market and it is known for it’s stylish man made lake, great restaurants and high end boutiques. The famous Loro Parque attraction is situated in this resort. What are the airports in Tenerife called? There are two international airports on the island, Tenerife South (TFS) and Tenerife North (TFN). Flights from the UK are usually scheduled to TFS for easy access to the holiday resorts. What local transport services are there in Tenerife? The local bus service (TITSA) is good, running regularly from the airport and to the resorts. There is a tram service (Metrotenerife) and it operates two lines, connecting Santa Cruz with La Laguna and La Cuesta with Tincer. There aren’t any trains on the island. Taxi’s can be found easily at the airport and at ranks in the resorts. What are the beaches like in Tenerife? There is a diverse range of beaches in Tenerife. Chose from large natural beaches, man made beaches, black sand beaches and naturists are well catered for. There are plenty of typical holiday beaches where families can enjoy warm and calm waters, hire sun beds and umbrellas and water sports equipment. What can I do in Tenerife? Everything you would expect to be able to do on a stunning Canary island and more! Take a hike up a mountain, splash around in the best water park in Europe, enjoy over 400KM of coastline or visit the science and astronomy museum! The list really is endless! Tenerife is an all year round holiday destination, although the peak seasons are during the summer months of July and August and over Christmas. In excess of 6 million tourists visited Tenerife in 2017. What is the currency in Tenerife? The currency in Tenerife is the Euro. What language is spoken in Tenerife? The official spoken language in Tenerife is Spanish. English and German complete the top 3 languages spoken in the resorts. What time zone is Tenerife in? Tenerife operates the Western European Summer Time (WEST) and the Western European Time (WET) from March until October. Tenerife changes it’s clocks on the same dates as the UK, so it is always the same time. Can I drink the water in Tenerife? The water is safe to drink but it can have a salty taste due to the high mineral content. We would recommend buying bottle water for this destination. The crime rate in Tenerife is low, but we recommend exercising common sense and not leaving valuables visible in hire cars or leaving items unattended. We would recommend hiring a car in Tenerife, this will allow you to explore the island at your leisure and fully appreciate the island. We hope we’ve covered the question you were looking for, but if not, contact us and we can add the answer to our FAQ’s about Tenerife. Read more about Tenerife and view our offers.